How does Dabur Chyawanprash work? Thus Dabur Chyawanprash helps us in fighting against germs, viruses and helps protect against infections, making us free to take on the outdoors, unhygienic surroundings, weather changes, pollution etc.! How do I consume Dabur Chyawanprash? Chyawanprash's recommended dosage is 1 teaspoonful twice daily preferably followed by warm milk or water. Can Dabur Chyawanprash be combined with other food? Ideally, Dabur Chyawanprash should not be mixed with any other food, but it can be taken before or after food. Can Dabur Chyawanprash be cooked or frozen? No, Dabur Chyawanprash should not be cooked or frozen. The suggested dosage is 1 tsp for adults and half a tsp. for children twice a day. Can my 3 year old kid have Dabur Chyawanprash? Chyawanprash contains various Ayurvedic ingredients that help in boosting immunity, protect against infections, and provides nutrition and energy. It may be consumed by children from 3 years of age onward. Can I have Dabur Chyawanprash in summers? Yes, Dabur Chyawanprash can be consumed in summers also. Germs causing infections know no season, and can strike you any time of the year. Daily intake of Dabur Chyawanprash strengthens your immune system & protects you all the yearlong. It is a myth that it can be used only during winter seasons. I have sugar (Diabetes) problem, is there any product that is sugar free? Dabur has prepared a sugar free variant of Chyawanprash known as Chyawanprakash. Having all the goodness of Chyawanprash, Chyawanprakash when taken in recommended dosage is beneficial for calorie conscious people and can be consumed by diabetic people too. Is Dabur Chyawanprash suitable for all age groups including elderly people? Yes Dabur Chyawanprash is suitable for all age groups, starting from 3 years age onwards. Dabur Chyawanprash is suitable for elderly people too. How many times can I take Dabur Chyawanprash in a day? It is advisable to take Dabur Chyawanprash twice daily. What are the benefits of Dabur Chyawanprash for children? Chyawanprash contains various Ayurvedic ingredients that help in boosting immunity, protect against infections, and provides nutrition and energy. Chyawanprash is also useful in general weakness. Chyawanprash is being used since ages in almost every Indian household. No specific safety concern has been reported till date. Studies conducted on Dabur Chyawanprash do prove its safety in preclinical studies, but safety during pregnancy and lactation is not established through modern studies. Where can I buy Dabur Chyawanprash? How is Dabur Chyawanprash different from other Chyawanprash available in the market? Dabur Chyawanprash has been derived from the original Ayurvedic formulation. It is also backed by Dabur's Quality Control Measures & Scientific Validation. My kid wants different flavors in everything. Does Dabur Chyawanprash have different flavors? Yes, Dabur Chyawanprash is available in 3 different flavours: Mixed fruit, & Mango. 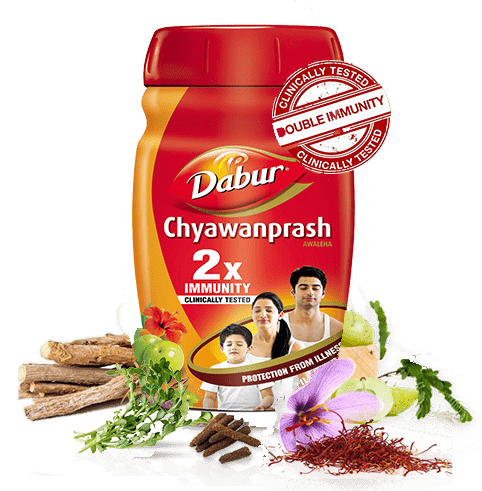 How does Dabur Chyawanprash helps to boost immunity?